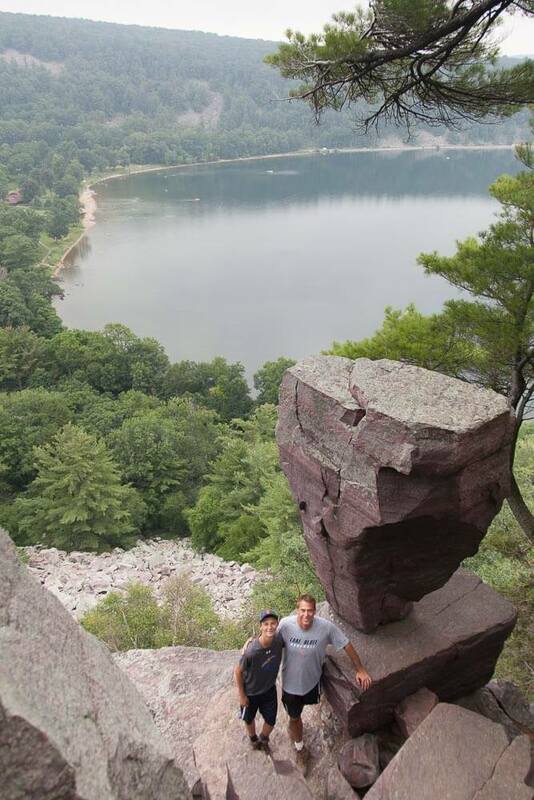 Hiking at Devil's Lake centers around the Lake itself. Options include easy, paved paths amongst the lakeshore talus slopes, rolling saunters amongst oak woodlands, and heart-thumping climbs along the 500-foot quartzite cliffs. On weekends and summer months, these trails are popular and well-used, but you can always find quiet serenity in the early morning hours, less-used trails and off-season months. 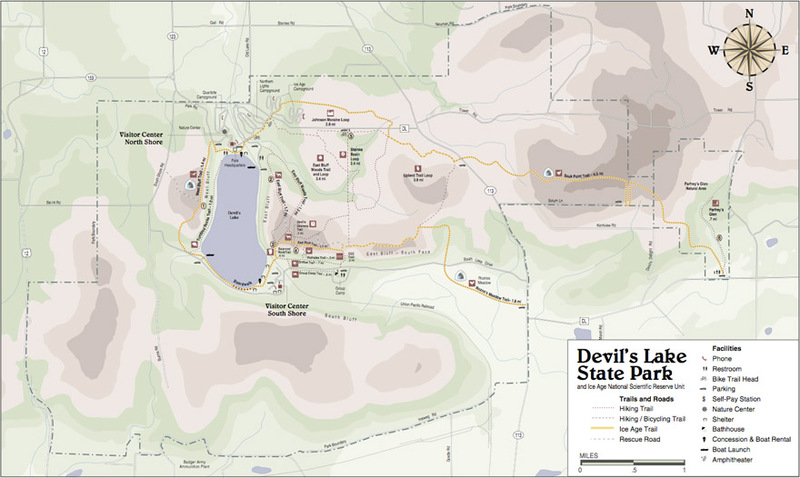 If you have already explored the main trails around Devil's Lake, it's worth hiking the longer trails east of main visitation area. Trails like Roznos Meadow and the Sauk Point Trail explore grasslands, wetlands, and riparian areas off the beaten path and provide longer distances for eager hikers. You may see signs for the Ice Age National Scenic Trail around the Lake. The IANST is one of our country’s 11 National Scenic Trails, a 1,000-mile hiking trail stretching from Door County to the northwestern Wisconsin-Minnesota border. The Devils Lake section is maintained by a partnership between the Park and the volunteer-run Dane County Chapter of the Ice Age Trail Alliance. Helping build the Ice Age Trail is a fun, social, and physcial way to contribute to Devils Lake and the larger Ice Age Trail effort; see the Chapter's event calendar for opportunities to get involved. Hiking Trails at Devil's Lake State Park Distances, difficulty, estimated time and short descriptions for Devil's Lake hikes near Baraboo, Wisconsin. Balanced Rock 0.4 15 - 45 minutes Most Strenuous Steep ascent/descent with overlooks of the lake and South Shore Picnic area. Find Balanced Rock, a boulder perched on a tall cliff, much larger on top than it is on bottom. CCC 0.3 15 - 45 minutes Strenuous Switchback route ascending through woods and talus to top of the East Rampart. See rock climbers attempting steep, tall faces near the top. Devil's Doorway 0.1 10 minutes Moderate Short off-shoot of the East Bluff trail visiting Devil's Lake most iconic landmark. 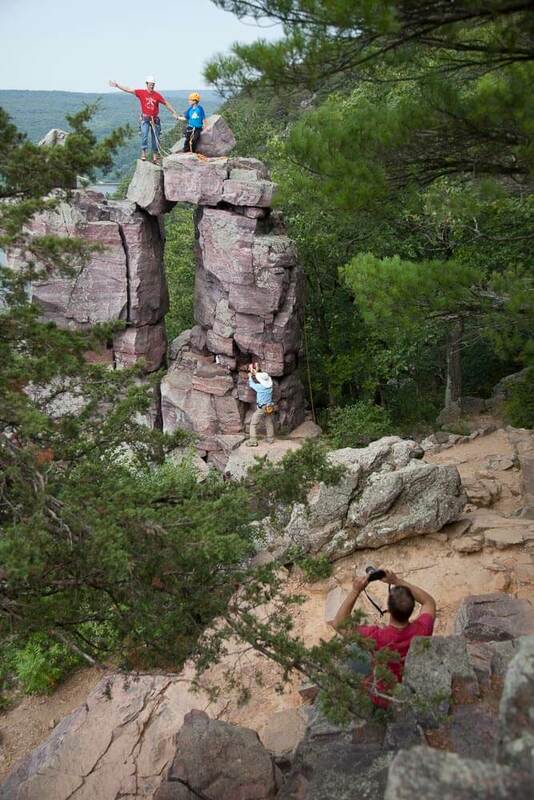 Huge, doorway feature stands atop the cliff edge, framing Devil's Lake beyond. East Bluff 1.7 45 - 90 minutes Strenuous Follows top of East Bluff connecting CCC, Potholes and Balanced Rock Trails with North Shore. 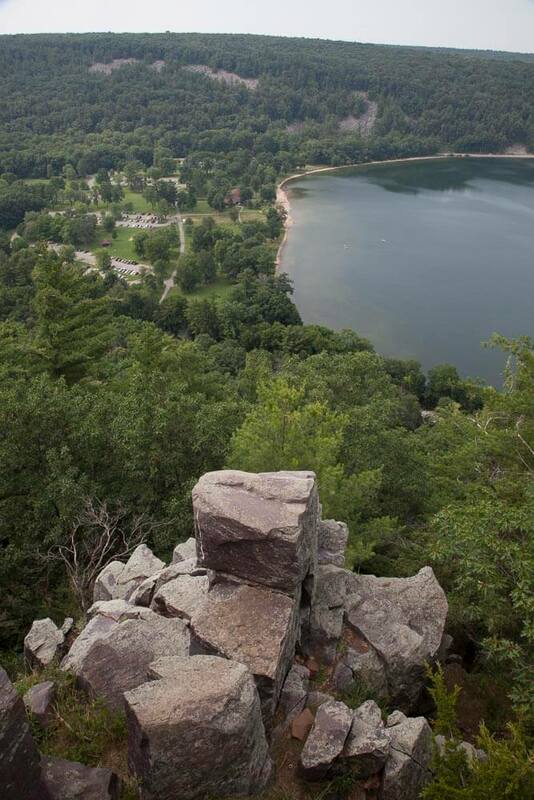 Numerous cliff-top vistas overlooking Devil's Lake, Lake Wisconsin, Baraboo and more. East Bluff Woods Loop 3.4 2 - 3 hours Moderate Easier double-track access road parallels East Bluff trail deep in the woods. Glacial erratics and a nice creek. Grottos 0.7 20 - 30 minutes Easy Traverses valley in South Shore area, connecting Balanced Rock, Potholes & CCC trails. Gorgeous mature oak forest with views of the East Bluff talus fields and large, cool rock hollows. Group Camp 0.5 15 - 20 minutes Easy Connects South Shore area with Group Camp loop. Johnson Moraine Loop 2.8 60 - 90 minutes Moderate Rolling trail exploring marshes and hummocks of kettle-moraine landscape. Excellent birding in marsh areas. Parfrey's Glen 0.7 15 - 30 minutes Easy Follows creek into a deep, lush gorge through deciduous woodlands. Deep, cool and mysterious gorge with enormous boulders and mandatory creek walking. 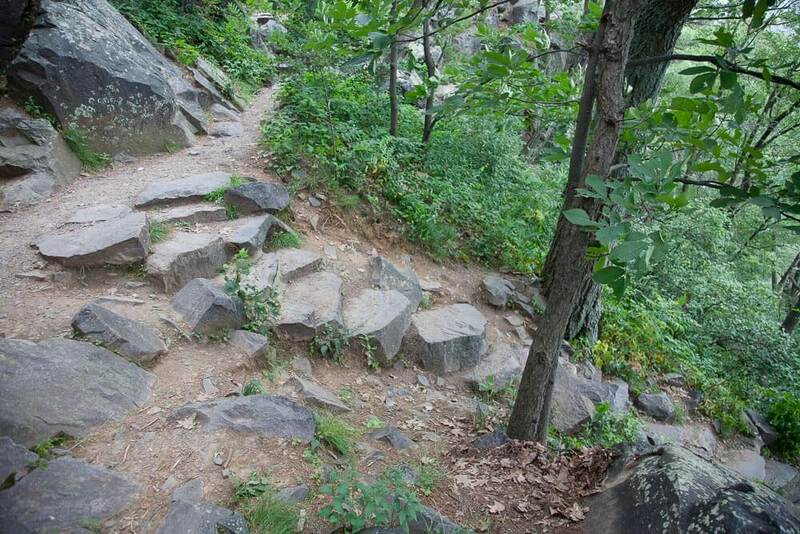 Potholes 0.3 20 - 30 minutes Most Strenuous Steepest path up East Bluff up hundreds of rock-hewn steps laid by CCC workers. Short but beautiful Red Cliffs, where a big pine grows between 30' red cliff walls. Roznos Meadow 1.8 45 - 90 minutes Easy Traverses rolling restored prairie at foot of ancient glacial moraine. Copious spring wildflowers, easy strolling and views of East and South Bluffs. Sauk Point 4.5 2 - 4 hours Moderate Rolling woodland trail connecting East Bluff area with Parfrey's Glen. Narrow, winding trail visits bogs, dense forest, highest point in Sauk County with views to Blue Mounds. Steinke Basin Loop 2.4 1 - 2 hours Moderate Rolling double-track trail in quieter areas of the Park. Serene quiet with visits to creeks and access to cliff views via connecting trails. Tumbled Rocks 1 20 - 45 minutes Easy Paved , mild trail follows foot of West Bluff through talus fields along the Lake. Views of lake and East Bluff. Great access for boulder scrambling, fishing and swimming. Uplands Loop 3.8 75 - 120 minutes Moderate Double-track loop connecting Steinke Basin, Johnson Moraine and East Bluff trails. Great options for connecting with other trails for a long hike, run, or mtn bike ride. West Bluff 1.4 60 - 90 minutes Strenuous Follows top of West Bluff, connecting North and South Shore areas. Spectacular views of Lake, North and South Shores, East Bluff from many rocky buttresses. Ice Age Loop 13.7 8 - 10 hours Strenuous Loop connecting West Bluff, East Bluff, Steinke and Sauk Point trails. Best opportunity to see all the Park has to offer in a long, continuous hike or run. A lakeshore-to-clifftop trail, Balanced Rock is a steep, uneven, blocky staircase ascending the quartzite talus slope from the South Shore Picnic area. 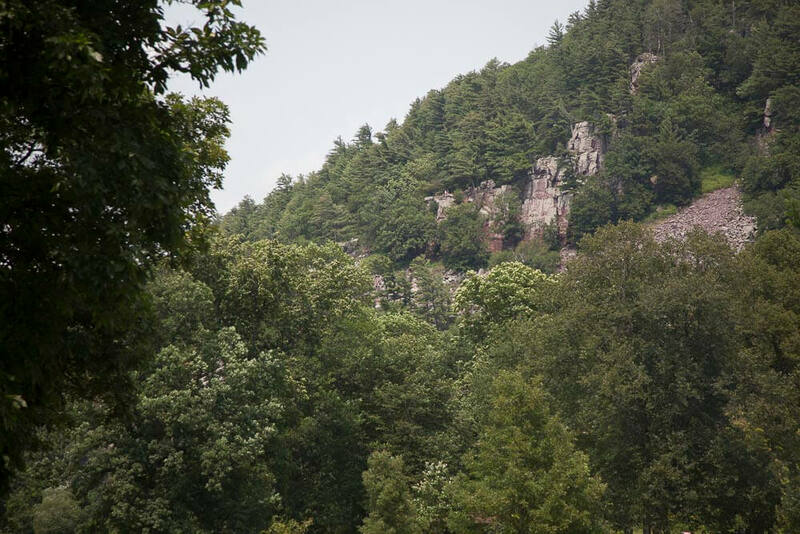 During any summer weekend, hikers will likely encounter climbers at the Balanced Rock Wall, about 1/2-way up the trail. 100 yards further up the trail, easy-to-miss signs point out Balanced Rock, the iconic trail namesake, perched precariously on the cliff edge. Great seats, views and promontories are all around the balcony in this area. Balanced Rock is a great trail for scenic views, featuring grand landscapes of Devils Lake, the South Bluff, and the South Shore beach area as the trail winds up the talus and in and out of the pines. During busy summer weekends, midday hikers may find this crowded, with "horse-to-tail" conditions as slower hikers create bottlenecks on the narrow trail. Get out there early to ensure a more enjoyable hike! Built by the Civilian Conservation Corps in the 1930's, the CCC Trail is the steepest way to the clifftops at Devils Lake. The CCC Trail departs from a parking lot inside the Group Camp loop on the south shore and swiftly ascends the talus to gain the high views of the East Rampart. You may not FEEL swift on this trail, however, as the serious incline forces many hikers to catch their breadth along the way. At least the great views provide a good excuse! The CCC Trail ends at the East Rampart, the largest and most popular climbing area at Devils Lake. Expect to see and hear lots of climbing activity near the top. 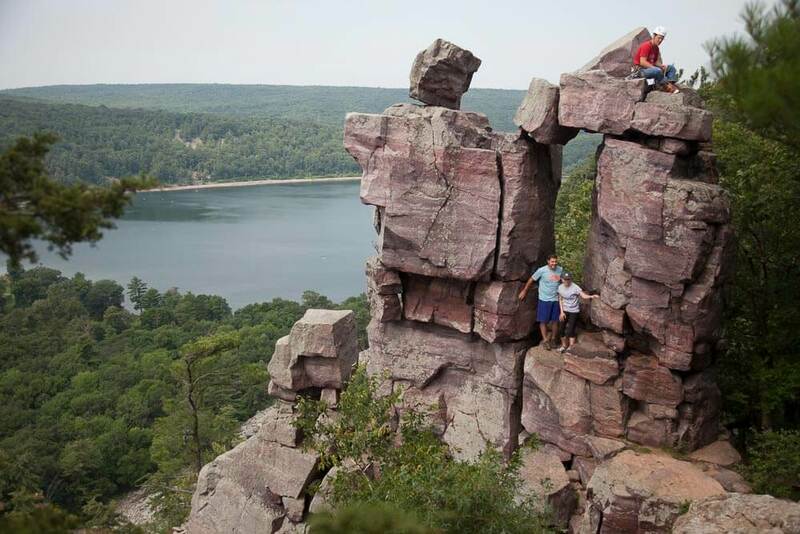 Once you reach the top, head west on the East Bluff Trail to enjoy even more spectacular views of Devils Lake and see lots of climbing anchor systems along the cliff edge. If all the climbing activity inspires you, consider joining us for some rock climbing of your own! The Park lists this as an independent hike, but it’s more of a spur off the East Bluff trail. But what a spur! 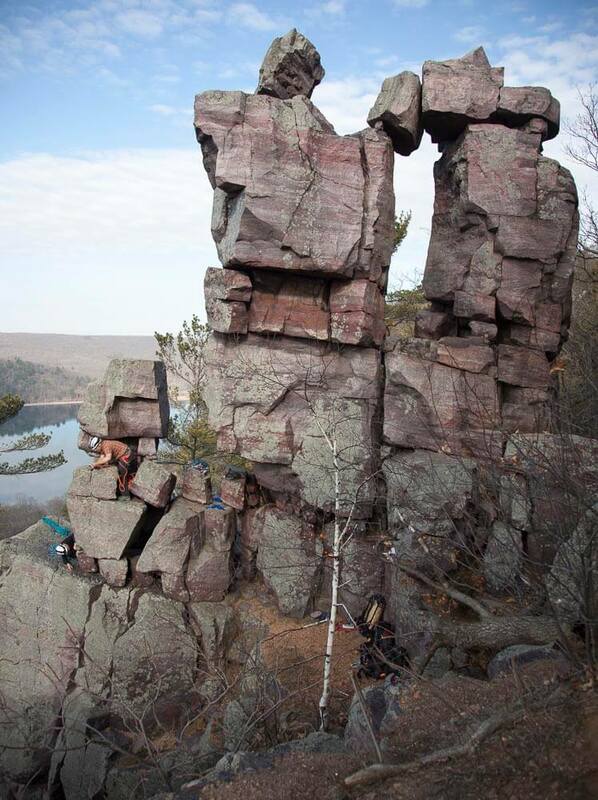 Devil’s Doorway is probably the most iconic formation at Devil’s Lake, a beautiful example of nature’s artistry. There's no better place to watch the sunset at Devils Lake, or to pose for that "we were there" family picture for the Christmas card. Expect climbers lurking all about the Devil's Doorway bluffs, as there are a bevy of good routes on and beneath the Doorway formation. If you're lucky, you'll get to watch a party climb the Doorway itself. 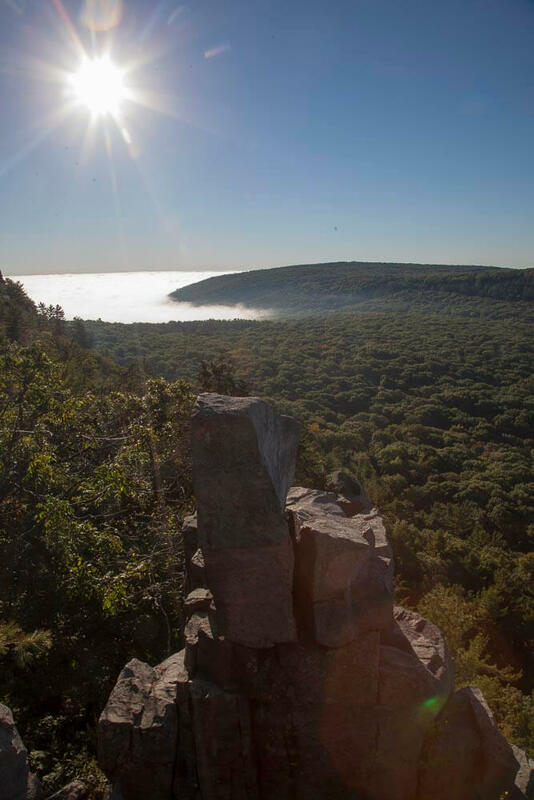 Connecting the North Shore and South Shore areas of Devils Lake State Park, the East Bluff Trail is one of two trails offering lofty, inspiring views of Devil's Lake and its tall, craggy bluffs. Departing from the east end of the North Shore Visitors’ Area is the easiest, most gradual way to reach the Devils Lake cliff tops. The route mixes dirt trails with occasional stone stairways, all through a wonderful hardwood forest landscape with regular opportunities to see grand views of the Lake. While you gain 500 feet of elevation along the way, the East Bluff Trail is much more manageable then the heart-thumping Balanced Rock, Potholes, or CCC trails. 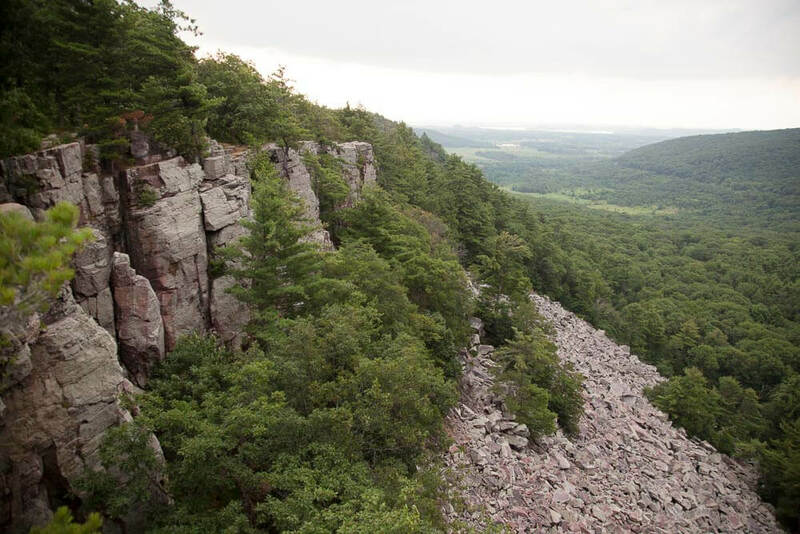 At the southeast end of the trail, you'll have your best opportunity to see rock climbers practicing their skills along the East Rampart, the longest continual section of tall cliffs at Devil's Lake. If you think you'd like to try climbing, consider our rock climbing trips or anchors classes. This trail is makes a good loop hike in combination with the East Bluff trail. Similar to the East Bluff Trail, the Woods Loop moderately ascends/descends the eastern flank of Devils Lake, but instead of following the cliff edge, the trail stays back in the woods, following a nice stream for a good stretch. Though the Woods Loop might have less dramatic flair, it provides a very nice stroll through a beautiful, open woodland with much less traffic than the more popular cliffside hikes. Choose this trail if you're looking for a quiet, gentle variation during a busy weekend. This level, gravel access trail runs roughly parallel to the South Shore Road, serving mainly to connect the three steep ground-to-clifftop trails (Balanced Rock, Potholes, and the CCC trails) along the South Shore. The trail gets its name from the numerous sinkholes found north of the pathway, between the trail and the talus slope. Since talus has been tumbling down from the cliff for thousands of years here, the ground beneath the cliff is very porous; in the summer, cool air emerges from the low points, hinting at great undergrounds spaces below the rumble. Grotto Trail starts at the South Shore Parking Area, then heads east along the talus edge, spurring off to the Balanced Rock, Potholes, and CCC Trails. You can make a nice, mild, woodsy loop by linking the Grottos Trail with the Group Camp Trail, about 1.5 miles total. This access trail links the Group Camp area with the South Shore picnic and beach area, running parallel to and just south of South Shore Road. Rolling and mild with a few steps along the way, link this trail with the Grottos Trail for an easy, enjoyable loop hike. If you're camping at the Group Campground, this trail makes car-free living possible for the duration of your stay! 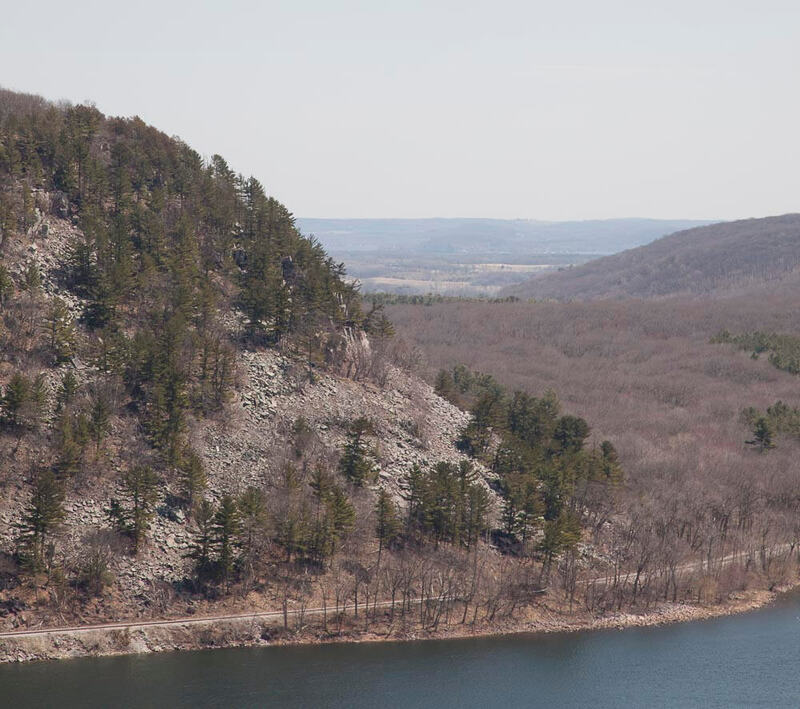 The most ambitious hiking route at Devils Lake, the Ice Age Loop combines the Sauk Point, Johnson Moraine, West Bluff, East Bluff, and Roznos Meadow trails for a scenic, burly, and athletic trail day. Traversing meadowlands, wetlands, forests, cliffs, creeks, and rocky glens, there is no better way to get to know Devils Lake State Park. Bring lots of food and water, and wear good shoes! See the Devils Lake Trail Map (top of page) for the complete Ice Age Loop, highlighted in a wide, gray line. 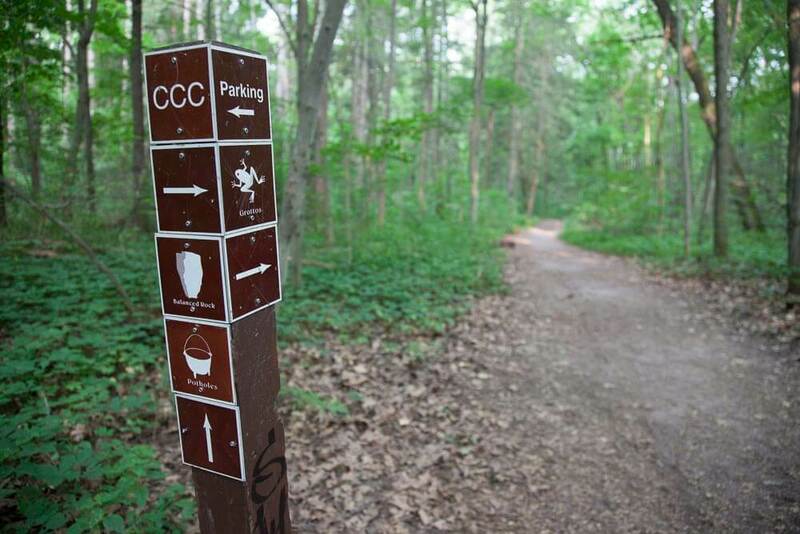 The hike is actually not a loop, and requires a cars shuttle from Parfrey's Glen to the Roznow's Meadow trailheads. A moderate trail exploring the marshes and hummocks of kettle-moraine country north of County DL, this is the northern-most trail at Devils Lake. The trail connects the Northern Lights and Ice Age campgrounds to Steinke Basin, creating good link-up loop opportunities with the Steinke Basin trail system. Excellent birding awaits in the marsh sections of the Johnson Moraine Loop. This moderate, gently ascending gravel footpath follows a small creek to locally famous Parfrey's Glen, the very first State Natural Area in Wisconsin. While a powerful flood wiped out cherished trail interpretation and structures a few years ago, the Glen is still a sublime and intimate place where huge boulders and delicate ferns compliment and accentuate each other. A popular location for photographers, Parfrey's Glen is an example of the unique geologic features the Baraboo Range offers that you can't find many other places in Wisconsin. PLEASE stay on the trail to protect unique and endangered species in this State Natural Area. No food, drink or pets here. A natural Stairmaster, the stone steps of this steeply climbing trail provide a serious workout while taking you to the top of the East Rampart. Start from the north end of the South Shore parking lot, crossing the railroad tracks, then heading east (right). Enjoy the flat, wooded Grottos Trail for a few minutes, then find a left turn (signed) heading straight up the bluff. The visual highlight of this trail is undoubtedly the natural stone hallway at Red Rocks, about three-quarters of the way up, where you find yourself surrounded by tall, beautiful red Baraboo Quartzite. A huge pine grows inside the hallway; it is really neat, reminiscent (to the author) of Bryce Canyon National Park. Near the top, look for ancient, rounded, eroded potholes formed by swirling water and a cool, tight hallway through red quartzite faces. The upper end of the Potholes Trail emerges just east of the famous Devil's Doorway. 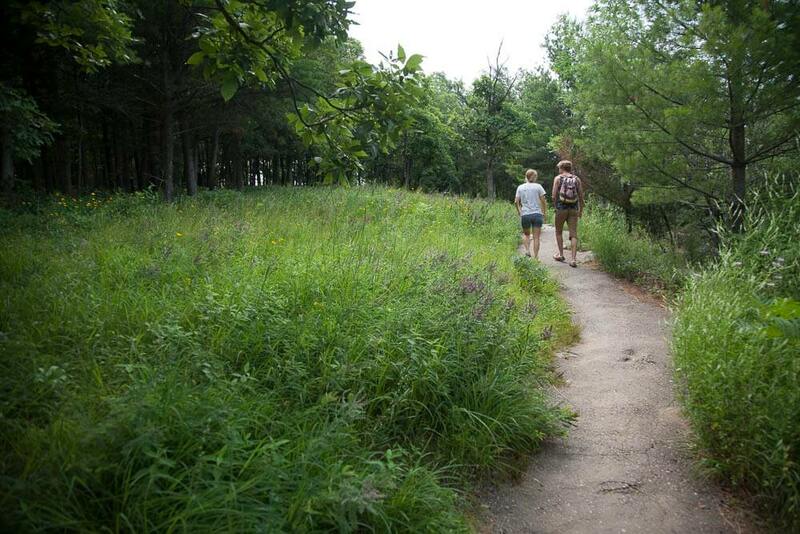 The park’s newest trail, the Roznos hike is an easy, grassy walk through a prairie restoration project in the valley below the glacial terminal moraine that plugged the eastern margin of Devil's Lake. Recommended car access is the large parking lot off County DL, just south of the east entrance. You can also park at a much smaller pullout inside the Park, but the spaces are often filled. Starting from the southern/eastern end, the trail winds through a prairie, eventually reaching a great view of the moraine. If you reach South Shore Road, you may either return the way you came, or cross the road and ascend through the woods to join the Uplands Trail (best if you have arranged a car shuttle). Connects the main body of Devil's Lake State Park with Parfrey's Glen, Wisconsin's first State Natural Area. The trail follows wooded ridges and hollows through reclaimed forest acreage. About half-way, the trail nears Sauk Point, the highest point in the Baraboo Hills (look for the tall cell phone tower to the north), in an open meadowy clearing. On a clear day, you can see the Wisconsin River and even Blue Mounds State Park in the far distance. The Steinke Basin trail system consists of wide gravel/grass trails that serve as cross-country ski route during winter. Level and easy, paths cross meadows and woodlands, with occasional small stream crossings along the way. Steinke Basin holds a number of small bouldering areas which require some route-finding to locate, but are fun diversions from the hordes during the busy season. Tumbled Rocks is a gorgeous lake-level meander through the lower West Bluff talus field, with fine Lake views and relatively flat terrain. As the most accessible and popular hike at Devils Lake, Tumbled Rocks can get crowded on busy weekends, but there are lots of opportunities along the shore or amongst the talus to find a quiet nook to sit and watch the world go by. Tumbled Rocks boasts the best adult swimming opportunities at Devil's Lake; find the huge boulders at the water's edge about halfway along the lake for prime jumping/diving and sunbathing. ALWAYS test the water depth before diving/jumping from heights; spinal cord and head injuries are life-altering accidents. This high loop trail holds some limited vistas, then explores the grassy meadows near Steinke Basin. You can view the Wisconsin River and Lake Wisconsin if you know where to look. Mountain bikes may travel this loop, so keep your eyes and ears peeled for speedy wheelers, especially around blind corners. The West Bluff Trail is similar to, but different from, its sister trail, the East Bluff Trail. While the ascents on the north and south side of the bluff are not the steep staircase affairs of the trails on the south side of the East Bluff, they are rigorous and tiring nonetheless. The West Bluff is higher than the East, but probably is equal in quality and frequency of great outcroppings and views. At the midway point, an access road meets the trail from the west; you'll find a few benches here, along with a survey marker, interpretive signage, and a viewfinder to gaze across the lake.